I've waited until I've had more than just a few opportunities to listen to this recital full through before writing a review. I know we had some discussion on this BEFORE the album's release, but I can't recall seeing a review here yet. So, let the fur fly! The majority of reviews and comments I've read have not been at all favorable - some even a bit scathing. 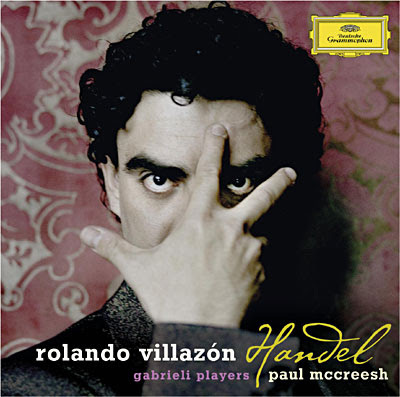 This is something I can't quite comprehend as the more I listen, the more I've grown to love what Villazon does here. Some have called it a "throwback" to the "bad old days" of full voiced singers singing Handel as though it were Mozart, or worse, Mahler. I disagree and rather strongly. While it certainly sounds as it could be a different approach to Handel singing, , I find it to be more of a a "modern romantic tenor" bringing his own style and deploying it in a decidedly bravura approach that makes most of h is choices in this repertoire exciting and true to the spirit of the baroque. The strongest criticisms seem to take issue with Villazon's somewhat over-the-top manner in delivering this material. That may be what I enjoy the most. Listen to the second track, the recitative to Grimoaldo's aria "Pastorello dun povero armento" or Serse's aria "Crude furie degl' orridi abissi" When has a tenor gone "there" so willingly, performing baroque music with this kind of abandon, not to mention intensity? This type of excess is oft considered "thrilling" when done by a female performer - indeed, Joyce diDonato in the same aria ("Crude furie") was praised to the rafters (and justly so!) for not only her bravura way with the fiery coloratura, but for the thousand different hues she hurled into the music, sinking her teeth into the meat of the text and almost spitting it out. But a tenor heard primarily in Verdi, Tchaikovsky and Puccini seems not to be able to make those same choices. What's particularly interesting to me is the way Villazon and McCreesh move through this material in ways that are almost unexpected, but which make perfect sense. After having heard some thrilling - near gasp-inducing leaps and flourishes, something like "Ombra mai fu" feels almost pure and cleansing and the simple addition of a well-executed trill makes the scene "pop"with life that is almost rare in a number like this. This is not to say everything is perfect on this disc, and sometimes the low tessitura (e.g., the central portion of "Scherza infida") can find our tenor getting a tad growly in music sitting a bit lower (even if only a note or two) than he's usually addressing. Still, we seem to be more forgiving when a soprano (or lyric mezzo) gets a bit gravelly on a low note. But, as heard in Villazon's "Scherza infida" there is a melting musicality thatmakes up (to these ears at least) for any shortcoming in the inability to sound perfect in every range. Another thing I love about this recital is the freedom of the ornamentation employed. Villazon's trills, runs, appogiatura, grupetti, etc., come off with a natural ease and authoritythat would be the envy of a number of singers who sing almost nothing BUT baroque music! Above all there is a sense of love and admiration for this music that comes shining through from start to finish. The level of musicmaking between Villazon, Paul McCreesh and the early instruments of the Gabrieli Players is never less than top drawer and all wed to a sense of joyousness and meaning which infuses every bar. Regardless of what one might think of his choices, I dare anyone to listen to, say, "Dopo notte atra e funesta"and not feel the thrilling connection between the performers and the music they're sharing. "My sight is already fading . . . death, I feel you! This horror is your punishment." While I can understand purists cringing here, we can't know for certain such a "device" was not employed in Handel's time and here and now, singer (and maestro) seem to find it a valid way of interpreting this dark moment and pull it off with complete conviction. If I've any disappointment it is in the way the recital ends - with St. John's two numbers from "La Resurrezione." This is not to say that they are not sung beautifully, or that Villazon is found wanting in the emotional intensity heard throughout the rest of the recital, but for my money they simply don't have the"oomph" to draw a disc like this to its conclusion. This, however is purely grousing on my part. This disc will ever find its way into a widely accepted Handelian catalog, but I think those willing to go along for a wild ride, fueled by fury, passion, joy and total admiration of one of the greatest composers of any era,will find something very, very special here.